Videos are fast becoming one of the most powerful tools of marketing promotion. According to the survey “The State of Video Marketing 2018” carried out by Wyzowl, 81% of businesses use video as a marketing tool. Out of those, 85% of businesses regard video as an important part of their marketing strategy, and 78% of marketers say video gives them a good ROI. The same survey also reveals that 95% of people have watched an explanation video to learn more about a product or service. Interestingly, where both video and text are available on the same page, 72% of people would rather use video to learn about a product or service. Clearly, product marketing through videos works for both businesses and consumers. Videos are used for their interactive nature in e-learning courses too, to easily reach the users, captivate their attention and engage them during the learning process. Based on the way people nowadays choose to interact with social media channels and advertisements, videos have an increasingly important role in the way promotional messages are communicated. The best way to make sure that your videos reach the widest possible audience is to make them accessible to speakers of different languages, and that is exactly what Video Localization will allow you to do. “Video Localization” describes the post-production processes of translating a video into different languages or adapting it for a specific country or region. During this process there are some important details to look after like, for example, providing a guideline in case some terminology needs to be left in the original language, or specify the pronunciation of some words or acronyms contained in the script. At the same time it is important to localize all the parts of the script that sound “foreign”, like the names of the characters, the currencies and measurements, while adapting all the idioms. The ideal end result of this process should be perceived as a script written purposely for the end user, rather than a translation. Removing as many linguistic and cultural barriers as possible will facilitate the acceptance and the understanding of the message by its receiver. Just like a distance of 220 meters does not “speak” to an American audience, a “two football field” long warehouse gives no clue to its German counterpart. Once the script is ready, it can be used for the localization of the video. 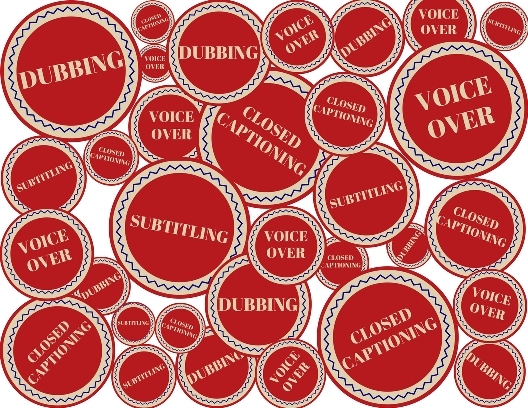 The most common methods of doing this are Subtitling, Voiceover and Dubbing. Subtitles are closed captions displayed on a video. In the specific case of localization, the viewer reads the translated text of the dialogues and the narrative on the screen, while listening to the original audio. The process of adding subtitles to a video starts with the timing of the original file, which will determine the timestamps (the time of the beginning and end of each subtitle) within which the new script in the target language will have to fit. The application of the subtitles is done with specific subtitling programs—there are many different ones on the market, and each company uses their favourite. Once the conversion is complete, the video is ready for delivery. The subtitles file can be delivered in different formats, according to the specific needs of the company requesting such a service, or sometimes the subtitles can be hard-coded directly into the video and a video file delivered. In this case, after the script of the video is translated into the target language, the localized version is spoken by an actor and recorded over the original audio of the video. Part of the voiceover process includes selecting the right voice talents for the recording. The selection will take into account aspects like the age and gender of the actor (while it is perfectly acceptable to use female voices in most of the western countries, some parts of the world are not so receptive when it comes to using female voices), and other linguistic elements like dialects and accents which may sound unfamiliar to the end users. All selected talents should be approved before actual production begins. Using professional narrators, although more expensive than an employee or a student, will make a huge difference in the finished product and the cost of the recording studio. Dubbing is a post-production process through which the original speaker’s audio track is replaced entirely by the voice of one or more actors speaking the target language. In this case the dubbed audio must be carefully synchronized to match the lips movement of the people speaking in the video, as well as intonations and tones. For these reasons, the process of video dubbing can be more lengthy and costly. Whatever your specific needs and budgets are, it is vitally important to ask a professional provider of localization services to look after your projects, to make sure that your name and brand will always be represented through quality and effectiveness, anywhere in the world. At Braahmam, during our 17 years in the field, we have gathered the experience, the knowledge and the expertise to help you make the right decisions when it comes to choosing the best method to localize your videos. With the assistance of our specialized departments, we are able to take your project through all the different phases of the video localization process, from the translation of the script to the final format file required for distribution, making sure that the results are effective and your investment pays off.